The time is brutal o’clock, the sun has yet to pop even a toe over the horizon and we are already moving in our 6ft bubble of light. Walking at first but we know what the day holds for us, so we have a spring in our step. As we zig-zag up to the col we look down into the back of the Carneadau as dawn is starting to stir. We laugh at the four climbers bivied out to get and ‘early start’ on Amphitheatre Buttress not because they are foolish but the fact that we will beat them to their route. Shoes off, rock boots on and barely time to catch our breathe as we start moving, slowly at first but you quickly find a rhythm as we start to ascend whilst the day lights up. Half way up we pause to enjoy the orange glow of the sunrise, our first reward for our alpine start. Back on the ridge we are now running down past the climbers still in their pits, one stirs only to see a blur of us moving onto our next route. The fantastic Rowan Route on the Milestone Buttress, one of the many classic VDiff’s. The idea had been mine, I had shared it with a good friend, who was by all accounts as mad as me. Life needs shaking up occasionally and if I had thought about it for longer then maybe we would have trained for the ordeal we were about to put ourselves through. The couch had grown comfy but right now we were definitely fresh off it and starting to push. The approach to the Milestone was nothing compared to our last crag and we motor up the polish of Pulpit Route in what seems like the blink of an eye. 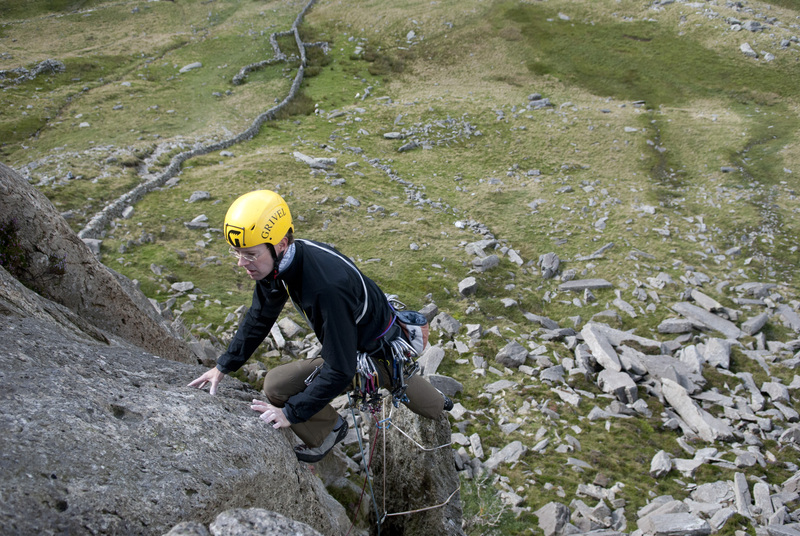 We now had to circumnavigate Tryfan round Heather Terrace to the base of Grooved Arete. I had only previously climbed the route by headtorch, but to be honest I am not sure how ‘on route’ I was given it’s reputation for route finding difficulties. All I know is we started in the right place and got to a top at some point. Today in the glorious morning sun we could see the whole route. As we changed footwear again we heard the distance shout of ‘safe’. Looking up we saw a team who must have had either a pre-dawn start or were finishing after becoming benighted on the 12 pitch route. I think the leader must have been shocked as just after his second pulled over the top of the final pitch he was promptly follow by Simon and I, and it was only 8am. The Super Direct on the Milestone Buttress. A simply stunning HVS. The final pitch of which has the type of exposure that will knock your socks off. 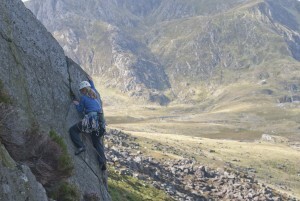 That crazy idea I had was to climb a great route on every mountain crag in Ogwen and beyond, in a day. Jogging down from the summit of Tryfan hopes were still high and fatigue was low. Yet already the heat was in the day, this was to be our enemy now. I had never been to Glyder Fach other than to scratch my way up in winter, today it was in perfect summer conditions. Though with the easiest route being Hard Severe, we, and when I say we I mean I decided that we should move together. Which is both safer and more dangerous at the same time. Safer because you probably won’t die if you fall, but more dangerous as you need absolute trust in your climbing partner who simply must not fall. I set off and led to the base of the top off-width in one long pitch with wild run-outs as we only have the smallest of racks. Promptly sending Simon up to do battle with the beast with a woefully inadequate cam three, like turning up to a gunfight with stick. Descending from near the summit of Glyder Fach to the base of the Idwal Slabs, my legs started to tell me something, ‘You should have trained for this’. My positivity for a route on every crag here and in the next valley and on Snowdon was slowly being tested. But before I had time to think we were soloing up Charity, I recall very little from the climbing of these next few routes, I am bewilderingly on autopilot. I lay one anchor, a foot or a hand and move another. Repeating this so many times that conscious thought expires, as dangerous as that sounds it probably makes it safer as you aren’t conscious of where you are and what you are doing, as those thoughts won’t help you here. The Amazingly Good Ideal Slabs. A playground for the novice trad climber. From the top of the slabs we switch to moving together again and quickly leapfrog up Lazarus and Groove Above and onto Glyder Fawr and Grey Slab. By the time we reach the base my resolved hasn’t so much been dented but battered to within an inch of its life. I lead off and the speed from earlier is well and truly behind us, I am now having to focus hard on the run-out climbing on the second pitch, reaching the comfort of a belay I really don’t know how long my body will carrying on working like this. It is midday and we have been on the go for eight hours already, as we jog down into Llanberis Pass my body is on its last reserves of energy. I managed another two routes, in the pass, but was utter spent and barely able to focus on anything. As I ran to the first crag the wife of one of the bosses I work for saw me and was so concern she suggested they stop and help me. He said, “No that’s Reevesy, his probably just running up from Nant Peris to climb”. The final straw happen when after Simon had shout safe and I was following him in now 30 degree heat, I stepped up onto a large foothold, so large I would have never have normally slipped, but slip I did. The thought of doing that when we were moving together was something I did not even want to think about let alone put myself into a position where it might happen. It is funny, as whilst we failed well short of our goal, I find it hard to view this as a failure, it was an awesome day out and comprised of climbing 10 classic mountain routes, covering inexcess of 20km on foot with way over 2500 meters of ascent and descent. 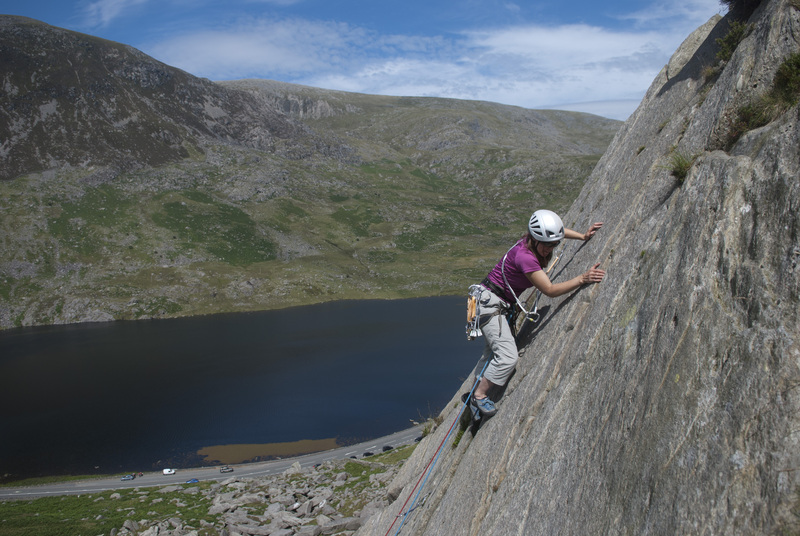 Whilst the majority of people won’t be stupid enough to try and do what we did, there will be a section of that Ogwen Enchainment that will be one of the best days out climbing you will ever have, even if it is just one of the routes mentioned. 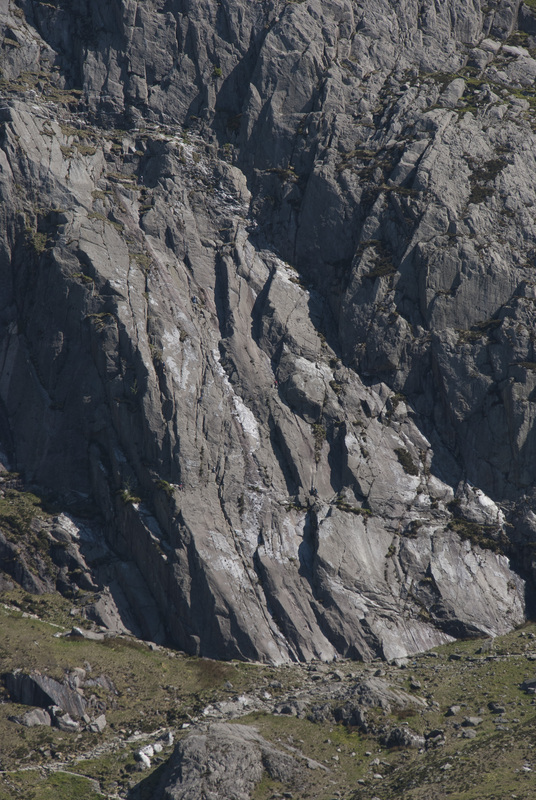 So here’s a break down of the classic Ogwen crags for the novice climber we have included a couple of cliffs that we ignored as too minor for our challenge. They would also have necessitated major diversions to our route, they are however worthy of a visit. Flake Crack a fantastic route that reeks of traditional thrutching. Whilst technically not in the Ogwen Valley, this high mountain crag is best accessed from the A5. Amphitheatre Buttress one of the most stunning VDiff’s in the Wales. Put up by the famous Lakeland photographers, the Abraham Borthers and Peak District pioneer and all round hero J.W. Puttrell, it has a very aesthetic quality. Following the crest of a spur that overlooks a gully, it has bags of exposure with vistas out to a remote and desolate valley. The climbing is sustained but never hard and the main pitch that swings onto the right wall, has the type of exposure that will take your breath away and make your heart skip a beat. It gets loads of sun in the morning and means it can be climbed on a sunny spring or autumn day, but once the sun comes off it expect the temperatures to drop. It is a joke amongst local instructor that you could throw a rack off the top of this crag and none of it would reach the ground such is the number, quality and ease of gear placements in the many cracks. Mix in the slabby nature of the rock and ample hand and foot holds and you have one of the best places for a climber to make their first lead climbs. Whilst there are no stand out classics, nearly all the route are worth climbing, although it is fair to say once you have done one you have practically climbed them all! This is a real mountain crag, the routes are long and generally easy. Some are borderline scrambles, however the best of the bunch are Gashed Crag and Grooved Arete. Grooved Arete is a challenger for the best VDiff mountain route in the UK, but at 12 pitches long you need to start early to both avoid queues on a summers day and give yourself enough daylight. Whilst this isn’t a great place to learn the ropes, it is a great place to learn about scaling alpine routes with quick and methodical changeovers or just come to rack up your first big British route. The climbing is generally steady away until you get to the ‘knights move’, although how chess like the slab is and whether you make a knights move or a bishops is very much down to you as modern rubber has tamed this infamous section of the climb. Try to imagine yourself as the first ascentionist in 1911, with a hemp rope and hob-nailed boots, stood looking at an apparently blank slab. The quintessential novice crag, with several easy routes up to VDiff and then one of the more memorable HVS to return to later in your climbing career. Both Pulpit Route and Rowan Route are Diff’s that are more than a little worn. Thankfully the edges are still there, just and are perfect places for novices to climb their first multipitched route. Although generally climbed in three short pitches, don’t be surprised if on you first visit it takes nearly all day to get from the bottom to the top and back down again. Due to a combination of your skills and long delays due to crowded stances. The descent gully is steep and it is best for the VDiff leaders to abseil down the top section, if not it will feel like you have soloed the crux of your day in the descent. The other routes of note are Direct and Superdirect routes. The original Direct is a character building VDiff which after you have made it up the well worn first and second pitches you are lead into a bay. At its back is a chimney that many climbers will be able to share their own terrifying tale of climbing. Just remember it is harder to get into it than it is to actually climb it! High above the valley this neglected crag has some amazing routes, many have some form of gnarly crack in. The easiest route is Chasm Route, which if followed leads into a labyrinth of chimneys, and if you are lucky you will eventually be reborn near the top of the crag. The real classic though is Direct Route, a Hard Severe that was climbed way back in 1907. According to Menlove Edwards it was revered for years as a mysterious route that was probably the hardest in the UK. Just imagine what it would have been like with a hemp rope tied round your waist and nothing to protect the leader. Karabiner’s might have existed, but Otto Herzog was not credited with making a climbing one until 1910. So be glad of you modern rack and take a cam 4 or some bravery for the top crack. A small crag that serves as a testing ground for climbers who have started to lead but would like a short and slightly harder challenge than the slabs that dominate the area. 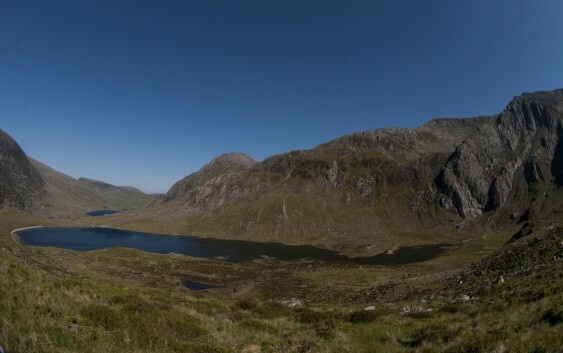 There are a whole host of routes around the severe grade and whilst none is a total classic, but that is probably because of the proximity to some of the best routes in the UK, as such all the routes are worth climbing. It has been a proving ground for years, as Two and Five pitch route shows that it was used imaginatively by Colin Kirkus. However in describing Marble Slab, one of the best routes on the crag, he advised on how to train for it and climb slabs in general. “If you have a slate roof – say on an outhouse – not far from the ground, you can learn the theory of slab climbing. You can find that you can walk on it, with care, in climbing boots. The slates won’t suffer much if you are careful, and anyhow its in a good cause. A crag where all the routes seem like something of a sandbag. The lichenous rock means that the rock rarely feeling dry, short steep sections that look innocuous from below turn into tense nail biting affairs for the belayer and will generally put hairs on the climbers chest. Yet this crag has amongst it several routes that will strike the fear of god into the hardest of climbers. It is not Rare Lichen the crags E9, but Monolith Crack, a claustrophobic tunnelling exercise that gives most people the fear. I went in, panicked and then took five minutes to squeeze my way back out. My overriding fear was that I would become stuck and die where I was jammed, and for the next twenty years climbers would have to climb over my rotting corpse tying my neck off as a runner! The best routes are at the right end of the buttress, two cracks stand out like a little piece of Indian Creek. The left is Flake Crack, a hair raising exercise up the tall needle like pinnacle. The realisation of its fragility comes as you back and foot up the inside and start to question whether the flake is moving, only to find a definite answer as you step off the top of the flake and onto the wall. Its neighbour Hereford’s Crack, is a very pleasant walk in the park if you can hand jam and a near death experience never to be repeated if you can’t. If you don’t fall in love with Idwal slabs when you approach them, then you surely will as you climb them. Although you have to like a crowd, as if it is good enough to climb then there will be other teams here. This is the go to place for novice multipitched climbers and deservedly so. Faith, Hope and Charity are all classic VDiffs, with Tennis Shoe offering a more challenging line at Hard Severe. On a busy day the climbers seem to attack in waves, as each ledge is large enough to accommodate a couple of teams. So whilst it might take time and patience’s to climb. The trick is to embrace the situation and engage the company in conversation. I have started a route not knowing my climbing neighbours and been engaged in full on banter by the middle of the slabs. All the routes generally have long 30 to 50 meter pitches that allow you to gain height quickly. The main slab is climbed in four or five pitches. By the top you start to feel really high up as you watch the people who are now the size of ants walk by. Here you face a choice scramble up left, or go up the continuation walls. Either way you eventually get to the infamous descent, often the crux on first acquaintance. If you decide to go up it is best to ensure you have enough time to climb both tiers as getting off the middle tier is a little problematic. The best routes are Lazarus and Groove Above, two very memorable severe’s. My advice is arrange the pitches so you mate leads Groove Above, as to this day getting into the groove feels like a desperate and rather sketchy pull even though I have climbed it hundreds of times. Although a big cliff, it is not as big as you’d expect. In fact most routes are only two pitches. Grey Slab is the easiest at VS, with a pitch that feels like VDiff and a ultimately easy but very run out top pitch that needs a steady approach. Grey Arete is more challenging as it is both bold and committing in places. Laybacking up the edge of the top crack is a fairly magical place to be though. If you are going to climb on this crag it is best to do the complete link up of the Idwals Slab and then continue walking and scrambling up the hillside to reach the base of this buttress. You can hike all the way up, it just seems silly to miss the opportunity to climb most of the way there. Mark Reeves the author of the articles on Vertical Life offers coaching, guiding and instruction courses across the world. For 6 months a year he is based in North Wales home to some of the finest trad and sports climbing in the UK. As well as writing Mark is an active rock climber and a qualified Climbing Coach with a Mountain Instructor Award and a MSc in Sports Science with Effective Coaching. He offers a variety of rock climbing courses at snowdonia mountain guides.